“The Works of Time” from Christian Faith Publishing author Evelyn Moskalets preserves the stories of those touched by the wisdom and works of God. By recording the reoccurring stories of people found throughout time, they and the lessons of God can be passed down from the current generation to next. “The Works of Time”: a record of the wisdom and impact God has had on people. 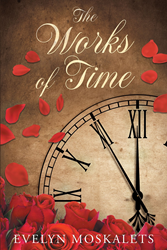 “The Works of Time” is the creation of published author, Evelyn Moskalets. Evelyn Moskalets is the beloved daughter of the Lord Almighty who He has gifted with a love for communication, leadership, and service. Evelyn was raised in a Russian home with the love of the Lord. She finished high school at sixteen and obtained a Bachelor’s Degree at eighteen. She is currently pursuing a medical degree, so she can become a pediatrician. Since she first held her baby sister in her arms at the age of two, she has wanted to care for the young. Published by Christian Faith Publishing, Evelyn Moskalets’s new book is an account of God’s works detailing His wisdom and the memories of those He has touched. All people desire longevity and a special place in the world. It is an instinct that exists in all of God’s creation. As time goes on, however, the identities and memories of countless people, who have been touched by God in countless ways, fade. To save these stories from death, they must be written down. As time passes, the same stories and wisdom emerge over and over again. “The Works of Time” is the fleeting attempt of author Evelyn Moskalets to save the memories of God’s works from this lifetime. The messages, verses, and writings within the pages are here to preserve His works for one moment longer. “The Works of Time” will reach beyond the author’s last breath. View a synopsis of “The Works of Time” on YouTube. Consumers can purchase “The Works of Time” at traditional brick & mortar bookstores, or online at Amazon.com, Apple iTunes store, Kobo or Barnes and Noble. For additional information or inquiries about “The Works of Time”, contact the Christian Faith Publishing media department at 866-554-0919.